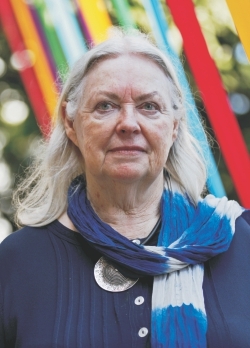 "My grandmother's generation were beaten in school for speaking Welsh,” shared British poet Gillian Clarke, as she sat on a stage in front of hundreds of Bangladeshis at last month's Hay Festival Dhaka. “If my grandmother was heard speaking Welsh in school, a stick was put around her neck and the child wearing that stick at the end of the day was beaten. It was a clever trick to incite the child with the stick, called a 'Welsh not', to report on other children to escape the beating,” she explained. “Welsh now has official status because, I think, of the power of the Welsh Language Movement, and mostly that was powered by the young. I'm proud to say my father was one of the earliest members of that. The movement was just so strong that the British government did not dare to deny it,” said the UK's National Poet of Wales. On her first trip to Bangladesh, Clarke said she was struck with how sensory and sensuous the experience was. “I observe and notice things,” she said, describing her journey from her home to the airport to Abu Dhabi's airport to Dhaka in poetic speech.